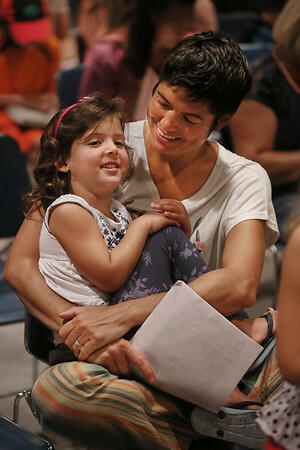 Paula Sullivan and her daughter Kailani settle into their chair to watch a play, "D.W. Goes to Kindergarten," during a "Rockport Counts Down to Kindergarten" event Thursday evening at the Rockport Public Library. The program, designed to welcome new kindergartners and to dispell any fears they may have, was sponsored by the library along with Rockport Elementary School, Pathways For Children, the Rockport Rotary Club and Cape Ann Museum.